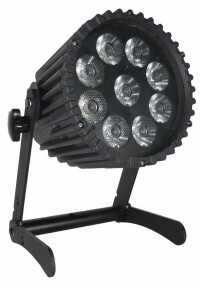 Astera LED-Technology has unveiled its new wireless spotlight, the SpotMax (AX10). This enhanced spotlight is now Astera’s biggest and most powerful spotlight, surpassing their previous high-power LED spotlight (the AL7-XXL) by than more than 30% in total LED power and brightness. The SpotMax has a myriad of new features and upgrades, including the addition of TruColor Calibration, amber LEDs, long-life Samsung batteries, state-of-the-art Khatod lenses, and high-quality Philips LEDs, plus many other benefits. The SpotMax produces a narrow, perfect 13° beam from its nine RGBAW LEDs, but the spotlight also comes with two easily attachable diffusers for multi-effect possibilities; one is a wide angle diffuser, and the other is a wallwash effect. The TruColor technology enables the SpotMax to achieve complete colour consistency, meaning that customers will always receive the exact same colours from every spotlight they purchase. This also applies to all future models manufactured by Astera. Further benefits of the TruColor technology lie in its dynamic power boost function, which acts as an increase in power output while maintaining the same colour point. The next big benefit of the SpotMax over its predecessors is the added amber LEDs, which will provide better colour mixing (as more of the colour spectrum can be used) and allow users to better illuminate brown/orange surfaces. This is a huge advantage for event and stage lighting companies as previously an amber colour would be emitted as slightly red. The added amber LEDs work together with the TruColor technology to give users the best option for colour accuracy and consistency in wireless event lighting. Users will also benefit from an exclusively engineered IP65 waterproof housing, which due to its Neutrik connector and Powercon True1 cable is also waterproof while charging. Furthermore, Astera has incorporated additional heat sinks for added heat dissipation, dual antennas for a more comprehensive communication between controller and fixture, and a multi-functional stand which acts as a carry handle and antenna protection for when the SpotMax is in transportation. The SpotMax, packed with nine RGBAW chips, can be controlled up to 300-500m away with a traditional hand-held controller or by Astera’s leading touchscreen controller, the AsteraTouch. This allows the user to place lights throughout an event, and then either control the lights by walking through the venue to get the feel of an attendee or control them from a place of height to get a visual of the event as a whole. With TruColor Calibration, Astera will test each and every wireless fixture with a modified spectrophotometer, and every colour is measured against the Astera colour index and adjusted accordingly. An extensive algorithm, written by Astera’s R&D specialists, automatically calibrates the brightness of each LED to ensure it matches the required standard. After storing the calibration inside the fixture, there will not be any differences between batches, leading Astera to achieve complete colour consistency.